Wall, NJ: Automated, rotary turntables in the Pharmafill(TM) line from packaging machinery manufacturer Deitz Co., Wall, NJ (www.Deitzco.com), enable packaging engineers to feed, transfer and accumulate bottles or other containers for extra control over the filling and packaging processes and improved line efficiency while maximizing the speed and production capabilities of each, individual machine. To be showcased at Pack Expo booth #S-5800 on Sept. 25th, 2017 in Las Vegas, NV, the rotary turntables meter the feed rate of empty bottles into the filling line, accumulate filled bottles at the end of the line for cartoning and case packing, and may be set at multiple points within the line to stage bottles for slower machines or to transfer bottles from one stage in the process to another without stopping or disrupting the automated process. 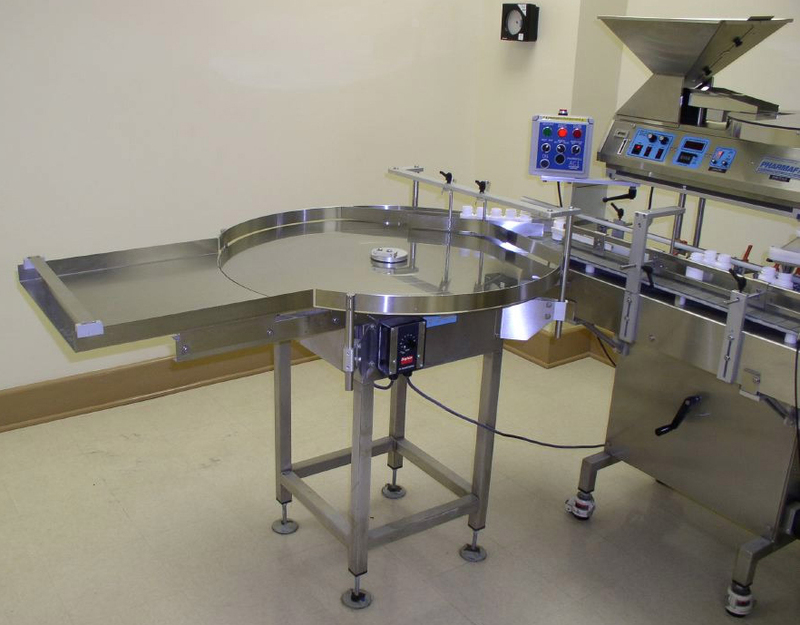 Developed for filling and packaging foods, beverages, pharmaceuticals, nutraceuticals, and other products, the rotary turntables feature sanitary, all-stainless steel construction with companion, stainless steel loading trays and dead plates. The packaging turntables are designed and manufactured at the company’s Wall, New Jersey, headquarters in a choice of top plate diameters from 12 inches to 48 inches as standard and in custom sizes as needed, and come set on casters for easy rolling to a conveyor. The turntables may be adjusted on the fly to rotate at a faster or slower speed and in either clockwise or counter-clockwise directions.